Our vision is for Alberta’s public lands to exist in perpetuity for the benefit of all generations and for the conservation of wildlife. Publicly owned lands, held in trust by the Government of Alberta, are managed in the public’s interest. An overarching Public Lands Policy is long overdue and must be developed through collaboration and meaningful public participation. Public lands must be properly managed to ensure that their ecological, social, and natural resource values are maintained for future generations. Public lands are often considered one of the best ideas the west ever had: land that you and I can enjoy that is a wild and undeveloped, provides a safe haven for wildlife, ensures secure landscape for headwaters, and much more. Public lands make up the majority of land that is not privately owned – about 60% of Alberta. This includes parks and protected areas, Alberta’s forests and mountains, and a large portion of the grasslands and foothills of southern Alberta. Following is an introduction to public lands and what they provide. On other tabs in this section you can learn more about the important historical milestones and issues related to public lands. Write a letter to our Premier (premier@gov.ab.ca) explaining that Alberta’s public lands are important to you. Volunteer with AWA as we work to maintain and protect Alberta’s public lands. Become a member or donate to AWA supporting our work to have strong public lands policies in Alberta. In the coming months, AWA will be releasing a series of videos that we hope will help build awareness about our public lands. You will be able to find them at the links below. Please help us inject more “public” into public lands and share the links with friends and others. Follow us on social media to see #AWAWildSpaces – links are in the footer below. AWA is grateful for support from The Calgary Foundation for Our Public Lands video series. Public lands are lands managed and administered by federal or provincial governments, on behalf of the public who owns these lands. The terms public lands and Crown lands are interchangeable, these lands are held in trust for Albertans by our elected government. Except for federal public lands – national parks, military land, and First Nations reserves– the ownership, administration, and management of public lands passed from federal to provincial control on October 21, 1930. Approximately 60 percent of Alberta is provincial public land, Private land covers 28.5 percent of Alberta and federal public land covers approximately 10 percent of the province. Since 1948, the province has been divided into two broad land use areas: Green Area and White Area. National Parks are federally managed and are not part of either the Green or White Areas. The Green Area (forested portion) includes most of northern Alberta as well as the mountains and foothills along Banff, Jasper, and the British Columbia border. In the Green Area, public lands are managed for their natural resources, ecological significance and services, and recreation values. Agriculture is excluded from land uses in Green Areas, with the exception of grazing. The White Area (settled portion) contains Alberta’s population centers and agricultural areas. The majority of southern and central Alberta, as well as the Peace River region, are within the White Area. Similar to the Green Area, public lands in the White Area are managed for their natural resources, fish and wildlife habitat, and recreation resources. However, a key difference between the Green and White Areas is that the majority of public land in the white area has been granted dispositions for various land use activities such as agriculture. 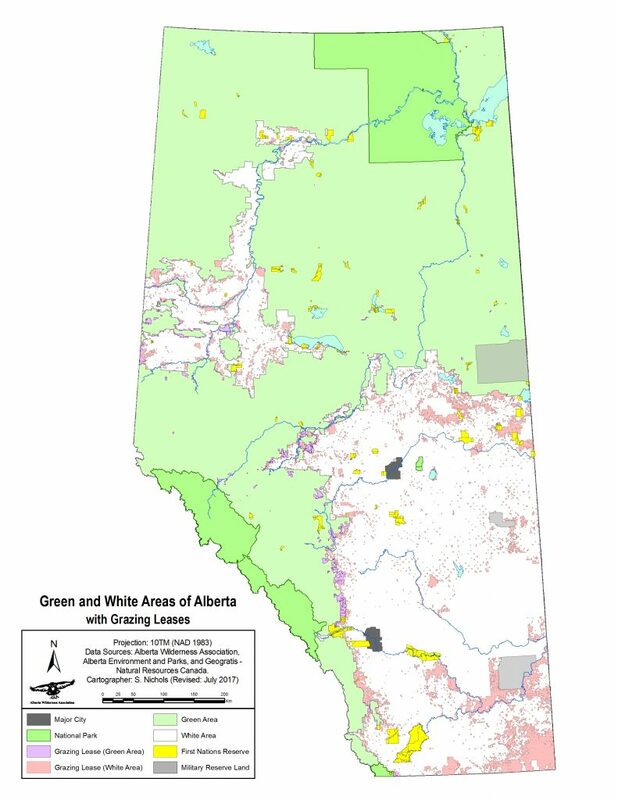 The following map shows the Green and White Management Areas the Government of Alberta has identified for public lands in Alberta and the areas that has been leased for grazing. Provincial public land may have a variety of uses, such as farming; livestock grazing; forest reserves for timber and water production; resource extraction, including coal, oil, gas, gravel, and minerals; and protected areas, including parks, wilderness areas, and other recreation and wildlife habitat lands. In Alberta, provincial protected areas cover 4.2 percent of the land base. AWA has always been a staunch defender of Alberta’s public lands. For more than four decades, AWA has consistently demanded a publicly developed public lands policy to deal with all aspects of public land, including access, sales, management, and conservation. No such policy exists. AWA opposes any further destruction of native prairie grassland and sales of public land until a public lands policy is developed through a transparent and democratic public process. Public lands contain some of Alberta’s largest, most intact wilderness areas, watersheds that contain the headwaters of rivers that supply fresh water to all three Prairie Provinces, and many of Alberta’s rare and endangered species. AWA is a staunch defender of Alberta’s public lands. Albertans are becoming increasingly concerned about water quantity and quality, cumulative effects of human activity, and loss of wilderness and wildlife habitat. The government’s management of public lands must address these concerns. Public lands must be managed to ensure that ecological, social, and natural resource values are maintained for future generations. For more than five decades, AWA has consistently sought a publicly developed public lands policy to deal with all aspects of public land, including access, sales, management, and conservation. No such policy exists. AWA opposes any further destruction of native prairie grassland and sales of public land until a public lands policy is developed through a transparent and democratic public process. Manage according to an ecosystem-based model that makes ecological needs primary and other uses secondary. Manage with the goal of retaining the current base of public land in perpetuity. Enshrine a public decision-making process that is meaningful, accessible, and legislated. Improve access to public land by eliminating the need to obtain permission from grazing leaseholders for all foot access and by making vehicle access less restrictive. Develop clear, meaningful, and enforceable legislation that emphasizes these principles. The last transfers of tax recovery land to municipalities from the 2011 sale will be concluded by spring 2017, after which all provincial tax recovery lands will have been transferred to municipalities. The Recreational Access Regulation is set to expire March 2017. The Land Use Framework process continues with the consultation and development of sub-regional and operational plans under the South Saskatchewan Regional Plan. The “multiple-use” paradigm, although starting to shift into conversations about watershed health and biodiversity, still dominates perceptions of the value of public lands. AWA sees public land as an interest of all Albertans. The public and grazing leaseholders should both share the stewardship responsibilities and be the beneficiaries of public lands, managed by the government. AWA supports performance measures and effective monitoring and analysis of grazing leases as recommended by the Auditor General. “The SSRP has… vagueness of the Land Use Framework and the broad discretion provided by Alberta Land Stewardship Act”. The ELC identifies a lack of adherence to environmental principles, little accountability, policy gaps, and not addressing mineral and surface activity cumulative effects. The Draft SSRP is released and public consultation begins. The Government of Alberta undergoes public consultation for Phase 2 of the South Saskatchewan Regional Plan (SSRP). A 74-page “workbook” is made available for the public to provide feedback on the SSRP. AWA chooses not to fill out the workbook as it is onerous and inaccessible to the general public and instead provides a written letter. The Lower Athabasca Regional Plan 2012-2022 is approved by Cabinet and becomes effective September 2012. AWA submits its comments on the draft land-use planning recommendations from the South Saskatchewan Regional Advisory Council. AWA is asked to provide feedback on Bill 202, the Public Lands (Grassland Preservation) Amendment Act. AWA strongly supports the passage of Bill 202, as it would be a step toward environmental protection, recovering species at risk, and reaching biodiversity targets. The on-again-off-again consultation process for the South Saskatchewan region is restarted and stalled again in 2012. Political leadership campaigns and a provincial election stall the promised public consultation on the draft recommendations of the South Saskatchewan Regional Advisory Council. The future for the planning process for the South Saskatchewan Region is unclear. Though the “public sessions” promised for Fall 2011 have been suspended, the December 19 date for public comment on the recommendations from the Regional Advisory Council appears to remain in place. AWA is quick to congratulate the premier on her decision asking for a process to ensure that future ‘Potatogate’ land sales are not allowed to go ahead. The Public Lands Act Administration Regulation (PLAR) comes into force, defining Public Lands Act amendments that came into force April 2010. Offense and penalty provisions introduced in the Act are “so potentially powerful that they lead one commentator to call them ‘The Sleeping Giant of Watershed Protection’” (Kwasniak, 2015). The PLAR replaces Dispositions and Fees Regulation and consolidates the Forest Recreation Regulation, Castle Special Management Regulation and Unauthorized use of Public Land and Recovery of Penalty Regulation. In a startling move, the Alberta government announces that the notorious ‘Potatogate” public sale is back on, despite the extensive outpouring of public opposition to the deal. Bids are invited to buy the land, including a requirement that at least half the land must be ploughed up. AWA reiterates its fundamental objection to the proposed land sale, and, once again, hundreds of Albertans begin to write to the government to express their opposition. The long‐term interest of all Albertans is best served by retaining public lands as a trust held by government for conservation purposes. Protective notations should be applied to public lands in large blocks of prairie, Environmentally Significant Areas, and other important habitat areas for at risk species. Regulations are needed that clearly lay out procedures to be used for public land sale or trade and that require public notice and consultation. Alberta government draft Regional Plan for the Lower Athabasca region. Plan seems to ignore widespread public support for stronger protection, but instead goes in the opposite direction. Instead of the science-based 50% protection recommended by the Boreal Forest Conservation Framework, (which Ontario, Quebec, Manitoba and the NWT are making great progress on) the Government of Alberta will only add 10% to the current 6% of “protected” land base in the region. And while conservation science recommends areas free from industrial development, the proposed new Alberta “protected areas” allow development of existing oil and gas dispositions. Some allow industrial forestry. 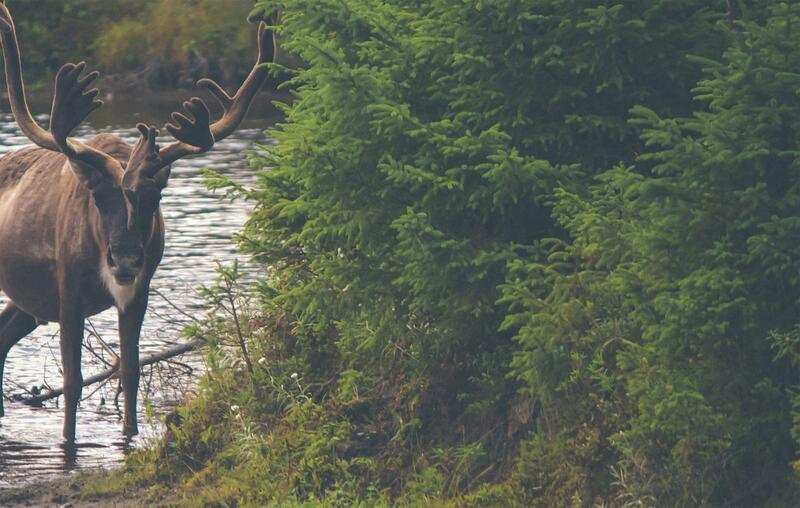 The vast majority of caribou habitat is not protected, and no complete range is protected. AWA believes this decision will guarantee the extinction of woodland caribou in the Athabasca region by totally ignoring Alberta’s caribou committee recommendation to immediately protect and restore their habitat. AWA responds to the draft plan, and encourages supporters to do likewise. The plan should be expanded to include fifty percent more protected and conservation areas, rather than the twenty percent proposed. AWA receives 912 pages of documents under Freedom of Information and Protection of Privacy legislation which sheds some limited light on the background of the Alberta government’s failed “Potatogate” public land sale. 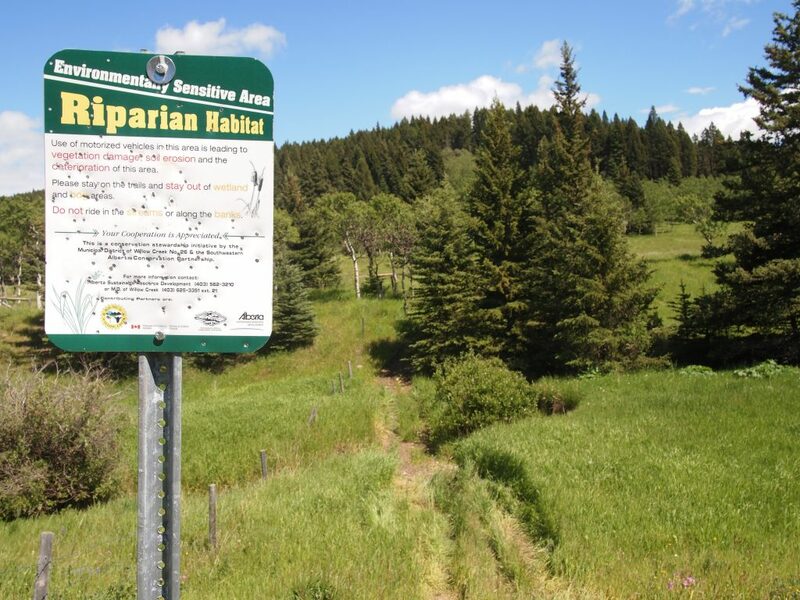 At the time that the deal was being discussed, Senior staff from the government’s own Rangeland and Fish and Wildlife Divisions made it abundantly clear that the application should be rejected, but their opinions were evidently overruled. Ignoring these and other recommendations, the government continued to push ahead with the proposed deal, which was only halted at the eleventh hour due to the huge uprising of public opposition. The Alberta government releases its report on the recommendations from the South Saskatchewan Regional Advisory Council (RAC). Surprisingly, a 9-month public consultation process is promised, include public meetings in the fall. Albertans are invited to complete a 78-page ‘workbook’ by December 2011. Meanwhile in 2011, the governent identifies additional tax recovery lands of higher conservation value based on proximity to named watercourses and water bodies, topographic features, and proximity to other lands that remain in provincial ownership – this means 35,000 acres of tax recovery land are being retained in the Special Areas to achieve conservation and stewardship objectives. This also means the remainder of tax recovery land is up for sale to municipalities. In early September 2010, AWA learns that, through a secret government process, 25 sections – or 16,000 acres – of public land is about to be sold to SLM Spud Farms Ltd. The land, near Bow Island, is predominantly native prairie and is known to be home for a number of species listed under the federal Species at Risk Act (including burrowing owl, ferruginous hawk, Sprague’s pipit, chestnut‐collared longspur, McCown’s longspur, short-eared owl, and long‐billed curlew). But despite the importance of this habitat to these species, if the sale goes ahead, the land would be ploughed up and used to grow potatoes. AWA launches a public campaign opposing the secretive ‘Potatogate’ land sale, and in an unprecedented outpouring of public opposition, hundreds of Albertans write to the Minister of Sustainable Resource Development to protest the proposed deal. The deal is criticized on a variety of grounds: the lack of any public process for a selling public land to a donor to the PC party; the secretive nature of the sale, the loss of irreplaceable native prairie and endangered species habitat; the water implications for new irrigation in an already over-allocated water basin. Alberta government contacts stakeholders to review draft changes to the regulations of the Public Lands Act. New regulations would make some improvements to enforcement of motorized access on public lands, but they would make no changes to the current process for selling public land. The Minister would still be able to sell of public land with no public input. AWA comments, September 3, include opposition to any sale of public land, particularly with no opportunity for public input. These comments prove to be surprisingly prophetic! AWA participates in stakeholder sessions around the broad principles of the upcoming Regional Plan for the Lower Athabasca region, calling for much stronger protection of vague “conservation areas” and meaningful protection of caribou habitat. Alberta government releases its summary of the recommendations of the Lower Athabasca Regional Advisory Council. This multi-stakeholder council includes representatives from tarsands and forestry industries as well as federal, municipal and aboriginal representatives. Recommendations include vague “Conservation Areas” though these are poorly defined, and would allow oil and gas and industrial forestry activities. 20-32% of the region is proposed as “Conservation Area”, much less than the 50 percent recommended to achieve biodiversity and species-at-risk commitments. Measures to protect threatened caribou habitat are minimal. The long-awaited Bill 36, the proposed Alberta Land Stewardship Act (ALSA) is introduced in April. A series of public information sessions takes place around the province throughout May, to explain the legislation to Albertans, with the emphasis firmly on explanation as opposed to consultation. The proposed legislation includes the broad, sweeping powers required to pull existing legislation into line to make it comply with LUF principles. But a major concern expressed by many is the firm emphasis on cabinet direction, with limited opportunity for public input, comment or appeal. This is the view expressed by AWA and a number of environmental groups at a meeting with Ted Morton, Minister of Sustainable Resource Development in a meeting in May. In September,Global Forest Watch release a report on behalf of a group of environmental organizations (AWA,Canadian Parks and Wilderness Society, Northern Alberta Chapter, Federation of Alberta Naturalists, Keepers of the Athabasca, Pembina Institute), Conservation Priorities for the Lower Athabasca Planning Region, Alberta. The report maps, and recommends protection for, Conservation Priority Areas totaling 44,075 km2 (or 47%) of the 93,225 km2 area of the Lower Athabasca Plan area. “The South Saskatchewan Regional Plan must include clear, enforceable thresholds on human impacts. Alberta Environment Network (AEN) is asked by the Alberta government to submit three names for suggested environmental representatives to sit on the South Saskatchewan and Lower Athabasca Regional Advisory Councils. AEN submits three suggestions for each council. All are ignored. Draft Land-use Framework released, July 21 2008. The draft plan recommends dividing the province into six regions, loosely defined by watersheds, each of which would have a regional planning body to ensure that development is tied to water and other environmental limits. AWA response is guardedly optimistic; while full of encouraging sentiments and principles, the one thing that is clearly missing is the provision of any legislative teeth to ensure that the document becomes more than just another admirable report gathering dust on a shelf in the government archives. Four stakeholder groups reconvene to provide feedback on draft. A second round of public comment on the draft plan is initiated in May. The Government of Alberta asks the environmental community, through Alberta Environmental Network (of which AWA is a member), to submit three nominees for the position of environmental representative on each of the first two teams (North and South regions). These recommendations are then ignored, as hand-picked advisory councils are selected for the Lower Athabasca and South Saskatchewan regions. The south region is divided into two – the South Saskatchewan and Lower Athabasca – making a total of seven land-use regions. The Sustainable Resource Environmental Management (SREM) program produces two significant projects: the Integrated Land Management program and the Land-use Framework initiative. Throughout 2007 six working groups meet to assess and develop recommendations for each Integrated Land Management Project Charter deliverable. AWA acts as a reviewer to the Stewardship, Measures, and Principles groups. The groups’ reports and recommendations are released in July, along with the reviews, for future implementation planning. From July to October, four multi-stakeholder working groups work toward developing strategies and suggestions for the Land-Use Framework. AWA is represented on the Growth and Resource Management Working Group. The working groups complete their tasks in October 2007. The government plans to develop a draft Land-Use Framework by the end of December 2007. AWA meets with Premier Ed Stelmach; Ted Morton, Minister of Sustainable Resource Development; and Hector Goudreau, Minister of Tourism, Parks, Recreation and Culture. AWA emphasizes the need for the Land-Use Framework process to be supported by 100 percent of Cabinet and by the Premier. During the meeting, the Premier states there will be an increase to the number of parks and protected areas in Alberta. Government invitation for participation by AWA and other members of the Alberta Environment Network in Land-Use Framework working groups is met with demands for improvement in the process. In the document “Criteria for Effective Process and Substantive Policy Direction for Alberta’s Land-Use Framework,” prepared in cooperation with AWA, CPAWS, Pembina, FAN and others, environmental NGOs demand effective process through goal clarity, clarity of government’s commitment to implement the Land-Use Framework, effective process design, and effective process support. As well, the groups want substantive policy direction for the Framework and criteria for a commitment to land-use planning in Alberta. The groups seek commitment from the Premier and Cabinet, a statutory basis and binding effect, and integrated planning. The government responds with a number of meetings with group representatives and with the participation of Ted Morton, Minister of Sustainable Resource Development, in an initial Land-Use Framework meeting in Red Deer. AWA attends and agrees to participate despite the lack of commitment to the demands of the environmental community. Minister Morton publicly states at the Red Deer meeting that he has the support of about half of the caucus for this process. The government holds 15 public input sessions across Alberta to gather public opinion on developing a Land-Use Framework. More than 780 Albertans attend. The input sessions focus on the challenges and issues facing land use in Alberta and the key characteristics and attributes the Framework should embody to deal with these challenges. Sustainable Resource Development Minister Ted Morton states that the Land-Use Framework will provide the context, overall direction, and decision-making framework to govern and manage land use in the province. It will guide land-use decisions on all land, except federal land such as national parks and Indian reserves. The Framework is intended to meet Albertans’ long-term social and economic goals based on good environmental management. Alberta Sustainable Resource Development announces that it will launch a public education and consultation campaign in the fall to develop a long-term plan for land-use management. Alberta Energy, Alberta Environment, and Alberta Sustainable Resource Development sign on to the Integrated Land Management Project Charter. Alberta Energy, Alberta Environment, and Alberta Sustainable Resource Development make a commitment to work together to realize Alberta’s vision of Sustainable Resource and Environmental Management (SREM). The Alberta government announces that it will be looking for public input in developing a provincial Land-Use Framework in the coming months. The government says it is committed to “sustainable development that protects the environment while encouraging economic growth.” The Framework’s details will be established through public consultation. The Integrated Land Management (ILM) program begins, with the goal of encouraging cooperation among land users in order to reduce environmental impact. It will also operate and implement Alberta’s Land-Use Framework. Numerous stakeholder workshops are held throughout 2005 and into 2006 to provide feedback on the ILM project, which when completed will dictate the guidelines of the ILM program. Public land should be managed according to an ecosystem-based management model that makes ecological needs primary and other uses secondary. Public land should be managed with the goal of retaining the current base of public land in perpetuity. A public decision-making process regarding public land should be meaningful, accessible, and enshrined in legislation. Within reason, public access to public land should be improved by either eliminating the need to obtain permission from grazing leaseholders or by making the process of obtaining permission less cumbersome. Public land management principles and tools should be included in clear, meaningful, and enforceable legislation. AWA holds a public lands roundtable in the fall. The purpose of the roundtable is to begin developing a vision and fundamental guiding principles for our public lands. AWA’s work continues through extensive research, interviews, and meetings. Bill 16 comes into force as the Recreational Access Regulation. New government web pages are developed, allowing recreational users to search leaseholder contact information by legal land description. AWA remains opposed to the new process and is concerned that access to public lands by the public is being unreasonably diminished. Agricultural Dispositions Statues Amendment Act introduced in the Legislative Assembly as Bill 16. The bill would require recreational users to contact the specific holder of a grazing lease or farm development lease before they entered the land for recreational purposes and follow the duties outlined in the regulations such as: pack out all litter, park vehicles as specified by the disposition holder, refrain from lighting fires without consent, close gates and no motorized access without the consent of the leaseholder. Leaseholders would be required to provide contact information to the department and allow access for defined recreational purposes unless certain circumstances exist, such as: livestock are present in a given area and access is restricted by fire hazard level. If recreational users access leased land for recreation, the liability of leaseholders for the recreational user is reduced. AWA News Release raises concerns that the new regulation will be an administrative burden and logistical challenge for leaseholders. AWA is also concerned that the Bill will unreasonably restrict access to the public, while granting easier access to the oil and gas industry by removing the right of the leaseholder to refuse access for oil and gas exploration. The position of AWA is that foot access should be allowed without permission on public land. AWA, FAN, and CPAWS write a joint letter to Premier Klein asking that he honour his commitments to increase protected areas under the Special Places 2000 program, the Alberta Forest Conservation Strategy, and the Alberta Forest Legacy. The letter is accompanied by a press release. Special Places 2000 is viewed as a substantive government failure and has become a major disappointment, with the environmental community’s suspicions of the process realized in the provincial government’s continued commitment to the interests of industry over environmental protection. CPAWS and FAN are enticed back to the Special Places process by Environment Minister Ty Lund’s promise to use legislation as the preferred tool to protect areas. Special Places is concluded. Under the program, 81 new and 13 expanded protected areas – Wildland Provincial Parks, Ecological Reserves, Provincial Parks, and Natural Areas – are added to bring the total protection in the province (including federally protected land) to 82,500 km2 or 12.5 percent of the landscape. However, some of the areas originally nominated under the program have been removed due to conflict with industry, and many of the new nominations have been chosen based on “least conflict” instead of ecological integrity. No attempt was made at protected areas integration or connectivity. By this time, most environmental groups have withdrawn from the Special Places 2000 process and have given up hope in the initiative. AWA, CPAWS Edmonton, and FAN write the Alberta Ministries of Environment and Resource Development a letter requesting that they halt the sale of leases for oil and gas activities within Milk River Natural Area and Chinchaga Wildland Park. The groups threaten to request public hearings should the government ignore their request and proceed with this sale. The Alberta government publishes Alberta’s Commitment to Sustainable Resource and Environmental Management, in which it commits to maximizing Alberta’s natural resource potential while ensuring maximum environmental protection. AWA assists with the development of the report Alberta’s Performance in Establishing and Managing Protected Areas during the 20th Century, a report inspired by Special Places 2000. The Special Places Provincial Coordinating Committee completes its mandate after identifying and recommending candidate sites for local committee review in all of the natural regions. The CAPP-ENGO agreement is released. It is an attempt made by environmental organizations and industry to come together to find common ground surrounding the challenges presented by the Special Places 2000 initiative. The group comprises the Canadian Association of Petroleum Producers (CAPP), the World Wildlife Fund (WWF), the Canadian Parks and Wilderness Society (CPAWS), and the Federation of Alberta Naturalists (FAN). The document states that all parties agree that “the vision for Special Places is a network of protected areas,” and that “in those Special Places designated to achieve the preservation goal, industrial activities are not compatible.” The group further agrees that within those sites designated as “special” on which ground industrial activity currently occurs, industrial activity must gradually be removed. AWA, with other conservation groups, coordinates a demonstration on Special Places 2000. AWA also works with other environmental groups to hold a summit meeting with the Premier and the Environment Minister with regard to Special Places 2000 and to put the program back on a science-based protection track. AWA makes presentations to the Whaleback Local Committee asking that they not further weaken the province’s Special Places 2000 process by recommending industrial activities for the Whaleback. AWA continues to apply pressure on the government to commit to the principles needed for an effective protected areas program through press releases and press conferences on Special Places 2000 issues. AWA decides against participation in Special Places committees because of the failure of government to legislate protective certainty and to protect sizeable land areas. AWA member Reg Ernst writes in response to grazing concerns that “grazing systems can be used to enhance wildlife habitat, but this requires intensive management and may exceed the resources available to most managers. Without the ability and commitment to provide intensive ecosystems management, the only way to meet ecological objectives is through legislated protection and enforcement (this is where Alberta has fallen short)” Environment Network News, Jan/Feb 1996. The provincial government, under the Ministry of Community Development, initiates the Special Places program. It is substantially diluted from the original draft document and ignores many of the Advisory Committee’s recommendations. Its vision is “to balance the goal of preservation, with the parallel goals of outdoor recreation, heritage appreciation, and tourism/economic development.” The program designates 29 new protected areas and invites all Albertans to nominate parcels of provincial public land for protection. Over 400 nominations are submitted. At the local level, volunteer local committees are asked to examine candidate sites and provide advice on boundary options, site-specific management guidelines, and appropriate land-use activities. Environmental groups are very disappointed with this approach because there was a lack of province-wide perspective on these local committees. A multi-stakeholder Special Places Provincial Coordinating Committee (PCC) is appointed to review public nominations, provide overall direction for the program, and advise on candidate sites for detailed consideration through a local committee process. The PCC represents the broad interests of Albertans and includes representatives from more than 20 stakeholder groups, including local governments, industry, and environmental organizations. Local committees are also formed, and their recommendations in certain areas often conflict with those of the PCC. The repeal of the Tax Recovery Act and changes to the Municipal Government Act prompted a review of tax recovery lands and policies involved – the government makes a decision to transfer tax recovery lands to the municipality upon request. The Special Places 2000 Advisory Committee Report is released and public comments are received from Albertans and stakeholder groups from across the province. The report reflects a sense of public urgency, drawn from the open houses and hearings, to move forward with the protection of Alberta’s most ecologically sensitive landscapes. However, certain groups such as snowmobilers, off-highway vehicle users, and members of the energy industry begin voicing fears that they will no longer be allowed access to large sections of provincial land. They send thousands of letters to the Minister opposing the Special Places initiative. AWA works hard with a number of organizations to garner public and industry support for the Special Places 2000 program. This includes signing two joint statements of support for Special Places 2000, one with the Alberta Forest Products Association and one with a group of major energy companies. AWA asks its members to phone, write, and visit MLAs to support Special Places. An Advisory Committee is struck to hold a series of open houses and group meetings encouraging Albertans to share their views of the Special Places draft document. Don Sparrow, in the presence of Prince Phillip, announces that Alberta is committed to protecting Alberta’s natural heritage and will set aside large tracts of land as protected areas. The Special Places 2000 program develops from this announcement. At the Tri-Council meeting of federal and provincial parks, environment, and wildlife ministers, the draft document for “Special Places 2000: Alberta’s Natural Heritage” is tabled. The Special Places initiative has four goals: preservation, heritage protection, outdoor recreation, and heritage tourism. AWA is invited by Alberta Tourism to participate in a Land-Use Planning Workshop. The GoA identified approximately 9,000 acres of tax recovery land to be retained, based on an assessment of lands withnational and international conservation significance. These lands were labeled as having commanding environmental sensitivity and as such, a decision was made not to transfer them to the municipalities. The lack of expressed provincial strategy and guidelines is resulting in frustration, misunderstanding, and inferior planning. The public wants more information on the precise roles of the various levels of government and their agencies in the planning process. The public is dissatisfied with the lack of public involvement in planning at the local level and the seemingly arbitrary authority of regional planning commissions. Municipal governments and planning commissions are frustrated by the lack of direction from senior levels of government on major policy issues such as growth strategy, decentralization, financing, and transport. The public is very concerned about the lack of availability of land for recreation. Concern is specifically expressed in regards to (1) the extent and location of public parks, (2) problems associated with recreational uses of private land, and (3) issues relating to access. The public is concerned about access to private land for recreational purposes, and landowners are concerned about allowing free public access to their lands under grazing lease. For the most part, landowners are willing to allow recreationists onto their leased land, providing that the owners are compensated for any damages incurred. There is widespread public concern over the lack of preservation of unique wilderness and natural areas; protection of sensitive lands; the disappearance of wildlife habitat, specifically in the Eastern Slopes; and cutbacks to areas previously designated as Wilderness or Natural Areas. The Land Use Forum holds 21 public hearings across Alberta, from January to May, to hear public opinion with regard to the areas on which it is tasked with reporting. Alberta starts using Integrated Resource Management (IRM) as the paradigm by which to manage Alberta’s public land. IRM is based on securing the most favourable mix of uses to achieve maximum benefits; this is accomplished by gathering input from interested and affected parties and then drawing up a plan that will yield the most units of resource output. IRM may provide for short-term financial gain, but these benefits are often not sustainable. IRM is based on the principle of multiple-use and ignores the need for protection of sensitive ecosystems that cannot tolerate high-impact activities. To come up with a good management scheme, one must incorporate scientific knowledge, technology, and ecological principles. For example, cattle grazing may be acceptable on public land if science that respects ecological values and ecologically based management principles is applied. In the absence of such science-based management, however, overgrazing often occurs, resulting in ecosystem damage.